First rule of interviewing David Fincher: Talk all you want about Fight Club. Ask him anything that pops into you head about his new $65 million films starring Brad Pitt, Edward Norton, and Helena Bonham Carter. About its unrelenting violence. Its murky morality. Its provocative politics (which one outrage critic has already denounced as "fascist"). Go ahead, ask. He won't hit you. "This is the part of the interview where you ask who the hell do I think I am and what the hell do I think I'm doing," correctly observes the 37-year-old director of what could turn out to be the most controversial release from a major studio since Natural Born Killers. "But you knoe, I honestly don't get what the big deal is. I've always thought people would think the film was funny. It's supposed to be satire. A dark comedy. I think it's funny. But I dunno," he goes on, stumbling onto an epiphany, "maybe I have a different take on funny." Oh, he has a different take all right, and not just on funny. As one of the most subversive mainstream filmmakers in Hollywood - the man who made moral ambiguity and psychological dubiety into a marketable cinematic style with his 1995 serial-killer thriller Seven and his 1997 Michael Douglas mind trip The Game - you can always count on Fincher for different. Still, even by his sublimely warped standards, Fight Club is a shocker; a film so harrowingly brutal and unabashedly out there it makes that elephant-dung art at the Brooklyn Museum of Art look about as disturbing as a big-eyed Walter Keane pixie. Norton (Amercian History X, The People vs. Larry Flynt) plays the movie's insomniac narrator, a corporate drone alienated by his cookie-cutter job and consumerist lifestyle; his only true joy is crashing support group meetings for the terminally ill. Pitt (who's done Fincher's bleak brand of "comedy" before, starring in Seven) plays his newfound pal Tyler Durden, a mysterious (and none-too-hygienic) soap salesman who helps Norton's character get in touch with his inner anarchist. Together, they start a support group of their own - Fight Club - where disillusioned men from all walks of life learn to work through their pain and find emotional insight by beating each other's heads into bloody pulps. "There's something about getting hit in the face that gives you an adreanlized version of life that's very profound," Fincher says as he relaxes in the sunroom of the Los Feliz, Calif., rental where he's spent the last few months putting a postproduction polish on his film. "It's like nothing else you experience in life." There's more. Like a story line about a cabal of anti-IKEA terrorists scheming to bring down the evil-home furnishings empire (and other oppressors, like Starbucks and Calvin Klein) by sabotaging corporate art and blowing up office towers; a sadistic love triangle involving Bonham Carter (Wings of the Dove) as a suicidal Goth goddess named Marla (who's wearing what looks like Marilyn Manson's eye shadow); and a surprise ending so shocking (and complicated) we'd have trouble revealing it even if we wanted to. And all of it spools in a synapse-frying rush of flashbacks, jump cuts, and stylish special effects that hang together like a Mobius strip than a motion picture. There's even not-quite-subliminal footage of X-rated body parts, though perhaps subliminal inch-age describes some of the inserts better. "This isn't the sort of movie you just sit back and watch," Fincher warns. "This is a movie that's downloaded in front of you. It doesn't wait for you. If you don't keep up, you're lost. It's like you've tripped and sprained your ankle. You have to tell the rest of the audience, 'Go on. Go ahead without me!'" Some people will undoubtedly enjoy the ride. In fact, a few critics have already declared Fight Club brillant ("an orgiastic pop masterpiece," according to American Psycho author Bret Easton Ellis' review). But when 20th Century Fox opens the film to the public on Oct. 15, Fincher may be dealing with more than sprained ankles. In the current post-Columbine climate, with Congress contemplating legislation to regulate violence in entertainment and Oliver Stone battling in court over crimes supposedly inspired by Natural Born Killers, a movie this viscerally savage and morally fuzzy - a film that could be misconstrued as actaully advocating violence - is bound to be explosive. The only question is, how loud will the boom be? Even the film's biggest star recommends taking cover. "Fincher is piloting the Enola Gay on this one," Pitt predicts. "He's got the A-bomb." This time, though, Ziskin didn't slip any Roy Orbinson songs into the soundtrack. "I was sitting at the edge of my bed in the middle of the night reading passages of this book to my family and calling up collegues on the phone saying 'You have to hear this dialogue!'" says Ziskin, recalling her first bout with Fight Club. "The ideas in the book were so potent and compelling and original." Fincher had spent a sleepless night with the novel as well - he'd even tried to bid on the rights himself - so it wasn't long before he was sitting in Ziskin's office pitching his directorial services. "it was one of those jerk-off meetings where you come in and say how great it's going to be," he recalls. "I told Laura we could do the movie a number of different ways. We could do it for $3 million on videotape, a sort of anarchist cookbook version. Or we could really go for it, try to embrace everything in the book, like the scene with the plane exploding in midair and the car crashing...."
Fox liked the second version, although originally the studio was planning on embracing only about $50 million worth of the novel. First-time screenwriter Jim Uhls was hired to translate Palahniuk's prose into a shootable script ("A faithful fleshing out" is how the novelist reviews the results), and Fincher started fishing around for movie stars willing to take on the film's raunchy roles. Sean Penn was briefly talked about for Pitt's part; Courtney Love was mentioned for Marla, the movie's only significant female character ("Too busy," says Norton, explaining why his ex-girlfriend didn't do the film). Of course, back during those early stages of preproduction--in 1997 B.C. (Before Columbine)--the violence-in-entertainment debate wasn't the front-burner political issue it is today. Nobody was particularly troubled by the film's bone-crunching milieu, or even paid much attention to it. Norton, for one, saw the movie as a '90s update of a classic '60s love story. "It reminded me of The Graduate," he says. "My grandfather was very uncomfortable with The Graduate. He thought it was negative and inappropriate. But my father loved it, thought it was a great metaphoric black comedy that dealt with his generation's feeling of disjointedness. And that's exactly what Fight Club is. My character is sort of like Benjamin, and Brad's character is like a postmodern Mrs. Robinson." In any case, Pitt wasn't deterred by Fight Club's violence, either. In fact, he was so elated at the prospect of working with Fincher again (understandably, since Seven was the actor's last movie to hit $100 million at the box office) he sprinted to the director's house to seal the deal. Recalls Fincher: "I hung up the phone and he was knocking at my door in, like, four minutes. And I live in a gated community. I don't know how he got past security." "Finch is hyperbolizing the moment a little," Pitt semi-corroborates, "but, yeah, I was pretty excited about doing it. I hadn't read anything like it, and I read everything. It's an astounding, extraordinary, amazing movie," he gushes, inventing his own Fight Club rule (talk about Fight Club, but only in superlatives). "It's a pummeling of information. It's Mr. Fincher's Opus. It's provocative, but thank God it's provocative. People are hungry for films like this, films that make them think." The movie certainly forced Pitt into some heavy thinking. "Fincher, Norton, and I had endless discussions about it before we started filming," he goes on. "We sat around for months batting around ideas, breaking apart every line like it was Shakespeare. It's such a hard film to get a handle on. How do you characterize something you've never seen before?" Oddly enough, about the only thing Pitt didn't contemplate during those long months of pre-filming rap sessions was what effect playing Tyler Durden--by far the ugliest role this prettiest of movie stars has ever undertaken--might have on his career. For an actor like Norton, who made his name by slipping into dark, difficult parts (earning his first Oscar nomination for his turn as a choirboy psychopath in 1996's Primal Fear), Fight Club was a no-brainer. But Pitt? Playing a nihilist antihero who shaves his head, urinates in cafeteria food, and manufactures his soap in ways that are 99 44/100 percent impure? "Actually, I didn't think about that too much," he says. "It didn't seem gutsy to me at all. It seemed like it would be foolish not to do it." "People who don't know Brad think he's a strange choice for the role," Fincher acknowledges. "But people who do know him--who know the Brad Pitt who hangs out at his house with his five dogs, who chain-smokes, who lives under an inch of dust--they think he's perfect." As it happens, the only one who expressed any reservations about appearing in Mr. Fincher's Opus was Bonham Carter. "I was the last one on board," says the English actress. "I wanted to meet Fincher just to ascertain that he wasn't a complete misogynist. The script was awfully dark, and in bad hands it could have been immature or possibly even irresponsible. But after meeting him, I could tell that it wasn't going to be a concern. He's not just an all-out testost package. He's got a healthy feminist streak." During shooting, Fox maintained a mostly hands-off policy toward Fincher. But there was one moment when Ziskin felt compelled to put her foot down--when she saw dailies of a post-coital scene in which Bonham Carter delivered that line about wanting to have Tyler's abortion. Fincher remembers her reaction: "She came to me with her voice quivering and said, 'You know, we just can't release a movie that has that line in it. Will you please shoot something different.'" He obliged, penning Bonham Carter's replacement line himself: "That was the best f--- I've had since grade school." "After we previewed the picture, Laura came up to me," Fincher says, laughing. "She said, 'Please put the abortion line back in.'" 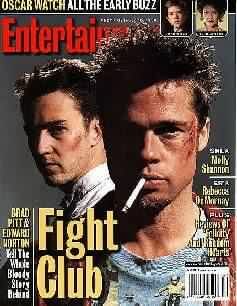 Originally, Fox had slated Fight Club for release last July, opposite Stanley Kubrick's Eyes Wide Shut. But last April, two lunatic teenagers wearing black trench coats went on a shooting spree in Colorado. Suddenly, fairly or not, Hollywood became ground zero in a political and cultural battle over the roots of teen violence. A frenzy of proposals aimed at curbing Hollywood's supposed excesses whipped through both the Senate and the House (most were eventually voted down, but a bill to begin a special congressional investigation of Hollywood's creative practices, complete with subpoena powers, is still under consideration). None of the above had anything to do with Fight Club's release being bumped back three months, at least according to Fincher. "It just wasn't ready," he says. "There was a lot of concern about the length of the movie. I had it down to two and a half hours, but we wanted to get it down to two-nineteen. I needed more time." Still, the Columbine tragedy (and the three other mass killings given saturation media coverage since then) has put a distinct chill in the air. And whatever else Fight Club may be--an orgiastic pop masterpiece, a fascist rant, a remake of The Graduate--it will definitely make a tempting bull's-eye. At this writing, with the movie only just arriving in theaters, it's too early for reaction from the usual Hollywood bashers. "I'm lucky if I see one movie in six months," says former Family Research Council leader Gary Bauer, reluctantly admitting that his jihad against the entertainment-industrial complex may have lost some steam ("I cannot find any constitutional case that I could make that would permit government limitations on this sort of thing," he says). Conservative moralist Bill Bennett hasn't viewed Fight Club either, although he was quoted in Larry King's USA Today column blasting the film's "illicit, pummeling free-for-alls." And while there's no word yet from Kathie Lee Gifford--who, Pitt recalls, once advised her viewers that it was their "moral imperative" not to see Fincher's Seven--you don't have to get up early in the morning to figure out which way her thumb will probably end up turning. Of course, fundamentalist presidential candidates and perky morning-talk-show hostesses aren't exactly Fight Club's target demographic; in fact, they're precisely the sort of people the movie hopes to offend. "I don't really care what Bill 'S---head' Bennett thinks about this movie," Fight Club producer Art Linson lets loose. "I don't care if he thinks it's irresponsible. It's not irresponsible. The fact is, there's more violence in the first five minutes of Saving Private Ryan than you'd see watching Fight Club four times. To me, Spielberg's movie is the one bordering on irresponsible, with all those limbs flying around on the beach." "Art has always reflected society," Norton offers more calmly. "Art doesn't invent violence. It doesn't inspire violence. This movie examines violence and the roots of frustration that are causing people to reach out for such radical solutions. And that's exactly the sort of discussion we should be having about our culture. Because a culture that doesn't examine its violence is a culture in denial, which is much more dangerous." Elegantly put. But you don't have to be a right-wing cinemaphobe to wonder whether Fight Club's true target audience--young males in their teens and 20s--will be quite so subtly Socratic in their interpretation of the movie. Or to worry that some may walk away with an entirely different message. Already there have been ominous (although unsubstantiated) rumors of real-life versions of Palahniuk's fictional Fight Clubs popping up in New York and California. If true, Fincher may want to give Oliver Stone's lawyers a call. Even New York City college professors have some concerns. "I found the film fascinating and provocative, often scathingly funny, and ultimately requiring a real leap of faith in psychological projection," ruminates Annette Insdorf, director of undergraduate film studies at Columbia University, who saw a sneek peek of Fight Club last summer. "But, yeah, I am worried about young males. What bothers me is that the body is rendered as an object upon which pain can and should be inflicted. I can see people asking if impressionable young men will be inclined to play Fight Club. But then," she says, adding a caveat, "I was concerned when Rambo came out too." Fincher, meanwhile, is still stuck on the comedy thing: "People say this movie advocates violence, but did M*A*S*H advocate alcoholism? That's how the characters in that movie dealt with their circumstances in Korea. And this is how the characters in this movie deal with their circumstances. This isn't A Clockwork Orange. It was never intended to be. It's a fairy tale, a coming-of-age story about choosing a path to maturity. "You know, I'm 37 years old," he goes on. "I don't purport for a second to know what a film should be, what entertainment should be, how much it should teach, how much it should titillate. I'm just trying to make a good, funny movie." And then the slightest glimmer of what might be doubt creeps into his tired, red-around-the-edges eyes. "You didn't think it was funny?" What was that first rule of Fight Club again?